Note from Beth: By the time you read this post, I’ll be in the air enroute to Rwanda for a training project. As a parent of wired kids, I think teaching digital literacy is very important for parents to do. Here’s some great advice from my colleagues at CommonSense Media. If you’re reading this blog, it’s probably because you’re a huge fan of social media and believe that it empowers all of us to connect, create, explore, and understand our world. I believe that, too, and I love working for an organization — Common Sense Media, an independent nonprofit — that’s dedicated to preparing kids to make the most of the incredible opportunities this networked culture provides us, while overcoming its potential pitfalls. It’s all about teaching digital literacy and citizenship: the knowledge and skills necessary to think critically, behave safely, and interact responsibly in a digital world. At Common Sense, we believe these skills are as essential to thriving in the 21st century as reading and writing. Kids need guidance in this area of their lives, too. We often hear the term “digital native” used to describe young people who don’t remember a time when phones were attached to the wall, but just because kids have only ever known a technology-rich world doesn’t mean they know how to engage with and through technology responsibly. These skills aren’t second nature, and it can be easy to get in over your head in a digital world and end up facing consequences small and large. Kids need guidance in this area just like they need help learning to tie their shoes, make a sandwich, or write a term paper. Who knows what’s coming at us? When Common Sense Media was founded, Facebook was a dorm-room diversion, and most tweens didn’t have their own cell phones. Location sharing? Instant updates to your whole community? An 8-megapixel camera on your phone? Still the stuff of science fiction for most. No matter what the future has in store, we need to prepare ourselves and our kids with a shared vernacular and a core set of life skills that transcend the technology flavor of the week and reinforce critical thinking, kindness, and responsibility. There’s no going back now. It’s well-covered territory on this blog and elsewhere, but it bears repeating that being a successful student, worker, leader, and citizen in the 21st century means knowing how to find and evaluate information online, maintain a compelling and respectable online reputation, communicate clearly and efficiently, and protect your own privacy and others’. Important stuff, right? So how do we teach kids and teens, who often can’t plan past lunch, how to think about their digital footprints and abstract concepts like ethics? And how do nonprofits and schools with a long list of demands fit this in to their busy days? I won’t pretend it’s easy, but there are a few ways to approach teaching digital literacy and citizenship that can help focus your efforts. Start with a clear vision. What do you think it means to be a good digital citizen? How does turning wired students into digital citizens fit with your organization’s existing mission? Is it about keeping students safe? Preparing them for college or jobs? Teaching them to use creative tools responsibly? Start with why and go from there. Common Sense Media operates on this vision: “We envision a world in which every kid knows how to make safe, responsible, and respectful choices and harness the learning potential of digital media in a 24/7 connected world.” That’s the vision that focuses all of our efforts. What’s yours? Keep learning focused and age appropriate. Kids as young as kindergarten can start learning the core concepts related to digital citizenship, but knowing how to tackle specific aspects with students of various ages can be a real challenge. [Shameless plug alert!] Common Sense Media’s totally free Digital Literacy and Citizenship Curriculum for grades K-12 can help. Our scope and sequence documents lay out the appropriate learning objectives and associated lesson plans, activities, videos, and more to teach skills that are developmentally appropriate. Check it out, and let us know what you think! Make it a whole-community priority. Just as media and technology have affected the nature of childhood and education, they’ve also affected the nature of parenting. Parents and other adult mentors are looking for guidance and appreciate opportunities to discuss their questions, frustrations, and hopes when it comes to their kids’ digital lives. Can your community be a hub for this kind of dialog? Check out our Parent Media Education Program for resources and ideas about how to integrate digital citizenship conversations into your parent-engagement plans. Question: We’d love to hear from you. In your professional career, how do you practice digital citizenship on a daily basis? If given the opportunity, how would you teach those important lessons to our youngest fans? Emily Esch works on bringing practical digital literacy and citizenship resources to schools around the globe through www.commonsense.org/educators. She lives in San Francisco and spends way too much time on Pinterest. Contact Emily. Thank you so much, Beth – we couldn’t be happier that you invited us to share about our programs on your blog today. We really appreciate it and hope your readers learned something they didn’t know! I was glad to see that none of your reasons was “They’ll get into too much trouble.” Just yesterday I had an exchange with a professor who said “Teach them that everything they do will be visible to everyone forever” is one of the most important aspects of digital literacy education. I do agree that consequences should be part of any education effort, but we do need to get away from the moral-panic mindset. Thanks for looking forward. Also appreciate the recognition that “digital natives” aren’t automatically adept, even though they view today’s tools differently than most of us older folks. Thanks for the comment, Brian! I definitely think discussing potential consequences is an important part of the puzzle but agree that it’s just one piece. Some of the most incredible educators I know are all about giving kids opportunities to try and fail in lots of aspects of their learning — the “hot stove” approach — and I think there’s something to be said for that here, too. What we need to help them do is reflect on their choices and experiences so they can see them as intentional choices rather than impulses. It occurred to me later that “Anyone in the world can see what you put online” is a reason for posting MORE, not less. I pretend to talk on the phone with my son all the time. I put my hand (phone) down and he doesnt get that means hanging up and then I remember only house phones hang up with a physical motion. 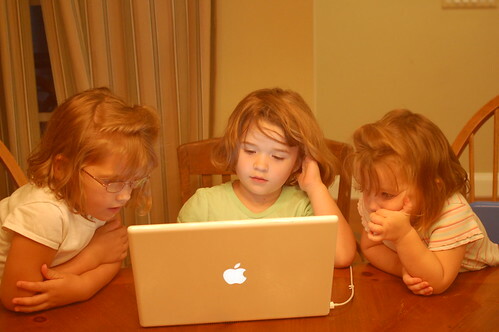 Do we watch our children online? Make them our friend on facebook? How does privacy work with the internet and wanting to protect but not stifle our children? Thanks! This is new territory for everyone! Guidance is needed. I appreciate the focus on providing guidance. This is very important. I also think it is important to stress boundaries. For example, when it is and is not appropriate to be using a smart phone as well as the importance of spending time away from the technology. I won’t allow my toddler to use a computer (or too much TV) yet because I think she should explore the natural world first. However, I am very glad to see that there are thoughtful tools we can use once my child does start using social media and other technology. Thanks for sharing. – to connect globally. Have you seen what @deputyMitchell, a deputy principal at a primary school in England is doing with his kids, and their blogs? Fantastic. I think it’s great you’re doing this as digital citizenship is such an enabler of democracy, and more participative than voting, which people don’t always do. I agreed the above reviews.I really appreciate the focus on providing guidance. This is very important for every children. I also think it is important to stress boundaries. Thanks for sharing. kids, and their blogs? Fantastic.